I love inspiring children to write. During my years in the classroom, I began every morning with an inspiring “Thought for the Day.” Students wrote a short paragraph as a journal entry. 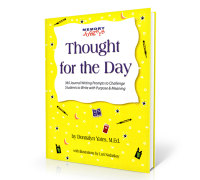 The thought for the day was either a quotation or saying that stimulated their thinking skills. The best part was watching them write intently and share their comments with the class. Many of the writing prompts started classroom discussions about a controversial subject. I remember the day students wrote about this saying, “Let your conscience be your guide.” What would you do if only one hot dog was left and neither you nor the person in line behind you had received one? Some children felt it was fine to take the last hot dog since they were the next in line. Many suggested sharing the hot dog and a few wanted to give the other child the hot dog and go without. Interesting! Conscience is a hard concept to understand, but by talking about how you would feel with your action, seemed to get the point across. One of my colleagues suggested arranging the quotations and sayings into different character building traits. For example, February’s theme is Love/Honesty/Valentines Day/Presidents/Integrity. Parents and teachers love being able to build on the themes. The off-shoot from Thought for the Day, is Kid’s Writing Journal. Same idea but children have lines to write on, in their own journals. Memorization of quotations or poetry seems to be a lost art. But anything you memorize stays with you all your life. Memorization also helps the brain by making synaptic connections. Encourage students to memorize two or three quotes or sayings each month.